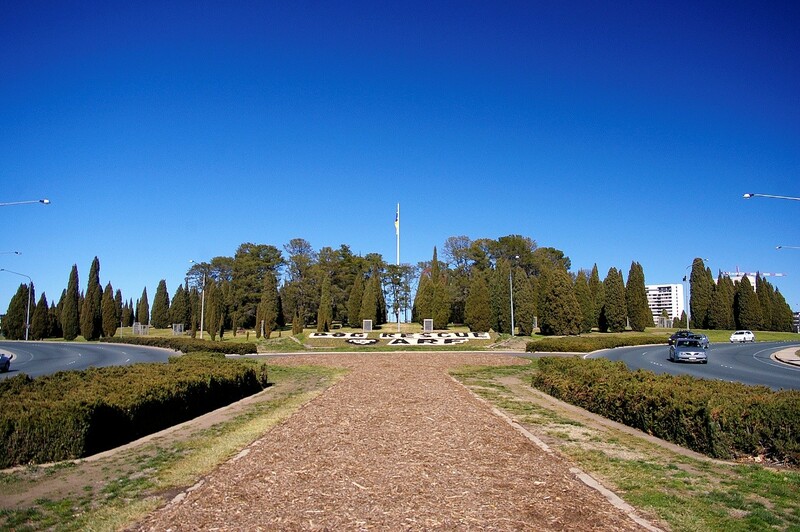 Canberra was developed at a time when the Garden City Movement was greatly influencing urban design. The concept of the Garden City Movement is to take the best elements of town and country life and combine them for a healthy living environment. From the beginning, there was an expectation that the new Australian Capital would be a shining example of what could be achieved using these garden city principles. Wide streets, along with large house blocks, were incorporated and the preservation of vistas to parks and hills considered important. To complement the green spaces of big parks and gardens provided by this form of urban planning, plantings of smaller shrubs and flowers have become an integral part of the city precinct and at times have been much cherished. Some are long-lasting elements while others have come and gone with the development of the city. One of the long standing permanent floral displays is at the Northern point of City Hill where London Circuit and Vernon Circle meet. The flowers that grace this space provide a colourful vista looking back down Northbourne Avenue. The designs have been many and somewhat intricate, with depictions of logos for community groups and important events. Records on floral displays at City Hill are the December Find of the Month. 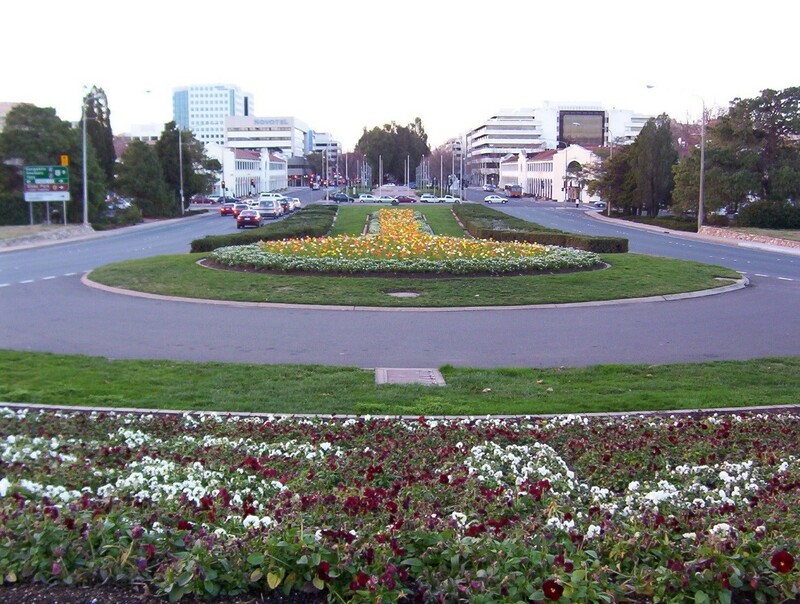 From the earliest days of Canberra the city was living up to its reputation of being a Garden City. As early as 1932 it was reported that the visitors of Canberra “can see ample evidence that the ideal of the planners of this city that it should be a garden city has been realised ”. The story went on to extol the beauty of the blooms in both public and private gardens. It seems that Canberra’s new residents had taken up the art of gardening and it was showing. With the extensive rose gardens around Parliament House and masses of tulips outside of the Hotel Canberra, the title was soon transformed to “A City of Flowers” . This changed with the intervention of World War II. 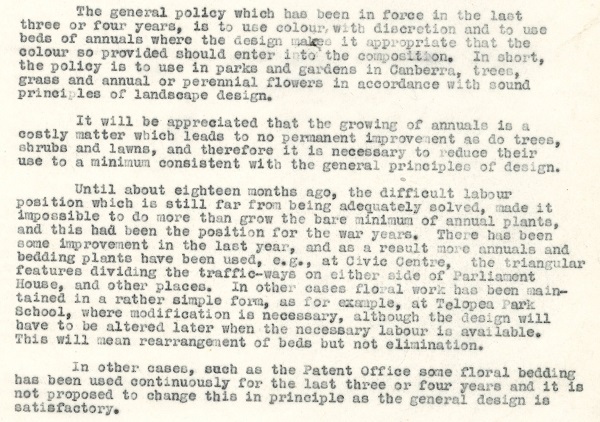 In May 1950, Dr Lewis Nott , Member for the ACT, asked a question on ABC radio which suggested that many of the flower beds and ornamental shrubs in the Canberra city area were being replaced with lawn. The Minister of the Interior, Hon. Philip McBride , requested a report from the Superintendent of Parks and Gardens, Mr Lindsay Pryor, outlining the current situation in relation to the planting of flower beds before formally responding to Dr Nott’s question. According to Pryor, the growing of annuals was costly and leads to no ongoing improvement to the overall environment in the way that trees and shrubs do. Pryor argued it was necessary to keep their “use to a minimum consistent with the general principle of design”. 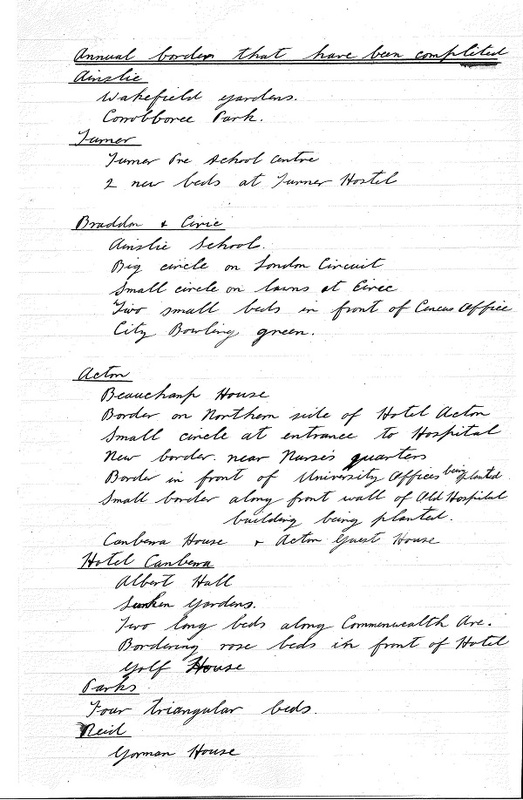 The issues with the availability of labour during the war had made it challenging to grow any more than just the bare minimum of flowering annuals, and floral displays had been maintained in a simple form. 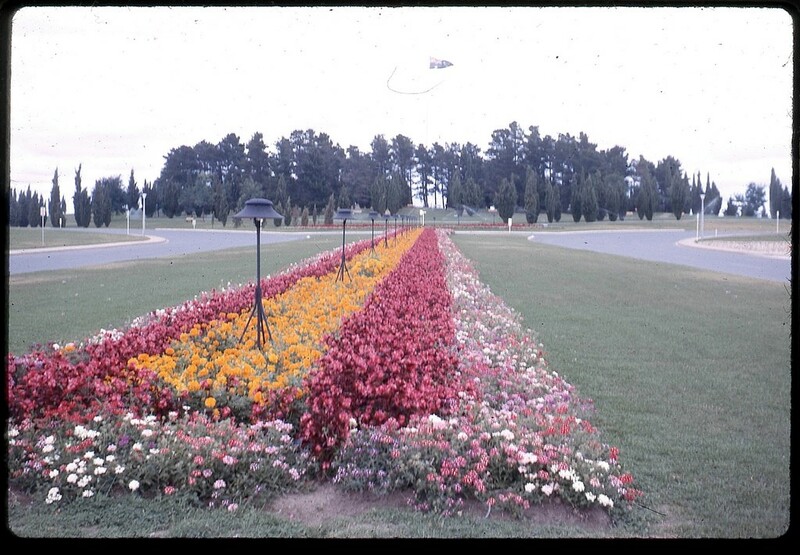 By 1952, the planting of annuals were an important part of the Parks and Gardens program, with Pryor requesting a listing of all floral boarders in Canberra and their status. Included in the completed borders for Braddon and Civic is the “Big circle on London Circuit”. City Hill forms one of the points for the Parliamentary Triangle and where six of Canberra’s major avenues radiate from Vernon Circle. The first plantings on City Hill were in 1921 by Charles Weston, the first Superintendent of Parks and Gardens. They consisted of “twelve oval shaped groups of Roman cypresses and six groups of Monterey pines” , plus some deciduous trees to provide colour. At its centre is a large flagpole proudly flying the ACT flag, and has done so from the beginning of self-government in 1989. City Hill has changed little in its composition and character over this time and has remained a prominent parkland since. Vernon Circle was built in the early 1960’s and the first City Hill flower beds were developed around this time. While the flowers themselves change, the premise for the garden beds have remained largely the same; a bed of flowers at the tail of Northbourne Avenue leading into Vernon Circle, with a showy feature bed on the edge City Hill facing back towards the City. In the early 1980’s the City Parks Administration tested different methods to “put more colour into the ACT urban landscape within financial and manpower restraints” . This included using the government owned Yarralumla Nursery to grow plants to flowering size before transplanting them into the garden beds and improving watering and mulching techniques. An advertisement hording was erected behind the City Hill feature garden bed to emphasise the floral display. 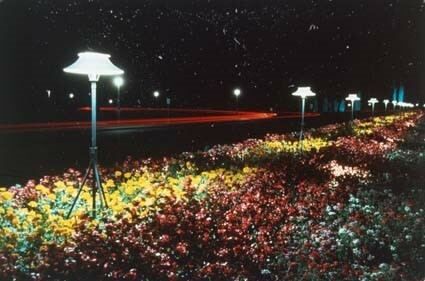 This was used to great effect to highlight Canberra’s biggest floral display of them all - Floriade. 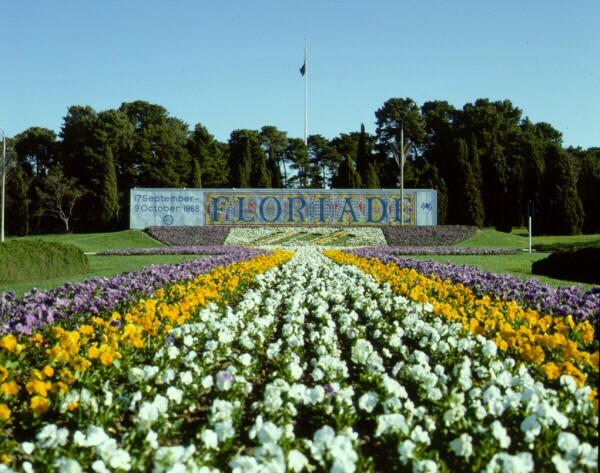 The first Floriade festival was held as part of the Bicentenary celebrations in 1988. What better way to showcase a flower festival than with flowers! The City Hill garden beds were laid out with colourful annuals in an arrangement that incorporated the Bicentenary logo. While the advertisement hoarding is no longer in use (although the footing are still available if there should ever be a need) the ongoing elements to the floral display continue. Although in more recent times, the floral avenue leading up to City Hill has occasionally been left unplanted leaving the feature bed to make the statement. 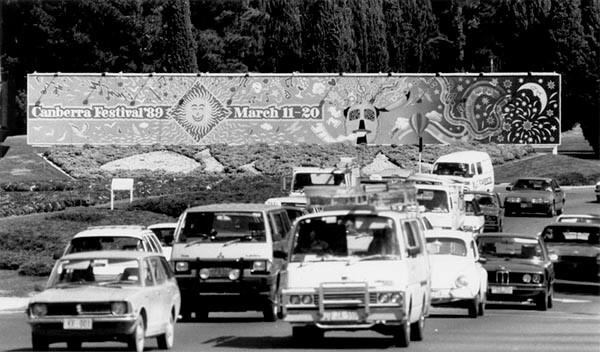 In August 1984, the Department of Territories and Local Government received a request from ‘World Cup Athletics – Canberra ‘85’ to allow the planting of large floral carpet of the World Cup logo on City Hill. The World Cup was to be hosted in Canberra from 4-6 October 1985 and was considered a big international event. The concept proposed was a “carpet of flowers, based on the World Cup logo [that] will greet visitors to Canberra for the competition” . The Committee was offered a substantial gift of between 30,000 to 50,000 seedlings from Arthur Yates and Co of a special hybrid viola in blue, yellow and white. The ACT Schools Authority was approached to engage school children in the growing of seedlings in donated margarine containers, commencing approximately a month before they were to be planted in the garden bed to form the impressive looking carpet. An additional 20,000 seedlings would be grown at Yarralumla Nursery to supplement the children’s’ efforts. It was suggested that when the seedlings begin to flower, the students would be invited to take their plant to the site “to create what will probably be Australia’s largest floral carpet”. The Primary Principals’ Association gave their support to the project. Even though the City Parks Division from the Department of Territories and Local Government would do the planting of the floral carpet, permission was required from the National Capital Development Commission (NCDC) to use City Hill as the location. 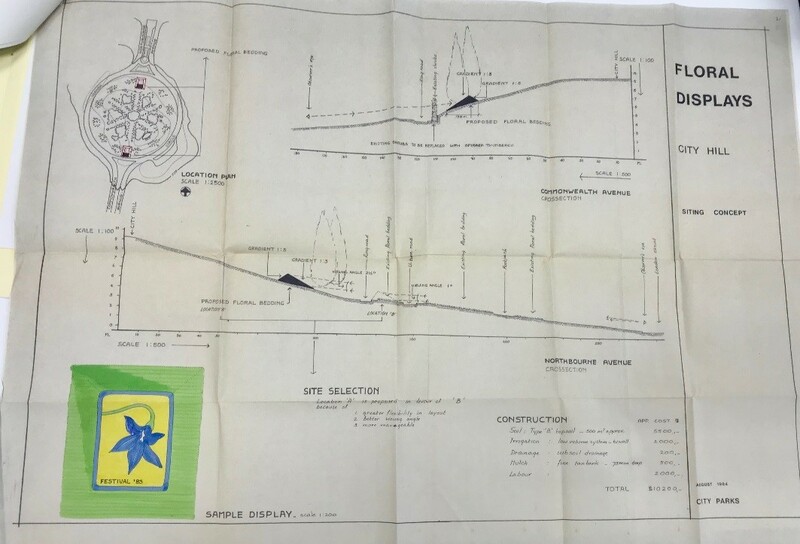 The original proposal submitted by the organising Committee showed plantings on both the northern and southern points of City Hill. The NCDC ultimately rejected the request for the floral carpet to be planted at the City Hill location, although recommendations for alternate planting sites were provided for either Regatta Point or Bruce Stadium where the World Cup event was being held. It is not clear if the floral carpet was ultimately laid, as the story within the records ends at this point. 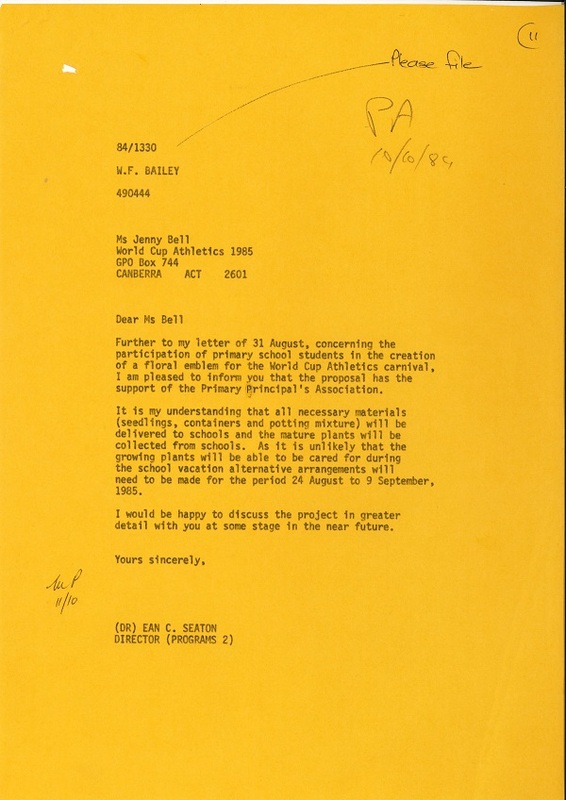 If you grew a viola at school or have photos of the completed carpet from World Cup Athletics – Canberra ‘85, ArchivesACT would love to hear from you.